This dish can be made in advance by mashing the vegetables until smooth, ready to add the butter when reheating. 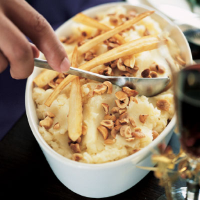 Transport the hazelnuts and blanched parsnip wedges separately. These are best fried while reheating the mash. Lightly toast and roughly chop the hazelnuts. Cut 3 of the parsnips in half lengthways, then slice each half into 3 wedges. Cut the potatoes and remaining parsnips into chunky pieces and place in a large saucepan with the parsnip wedges on top. Cover with plenty of cold water. Bring to the boil, reduce the heat and simmer gently for 5-6 minutes or until the parsnip wedges have softened slightly. Remove the wedges with a slotted spoon and cook the remaining vegetables for 10-15 minutes. Drain and return to the pan. Mash the vegetables in the pan until smooth. Add the butter and walnut oil, and stir until thoroughly combined. Season to taste. Heat the vegetable oil in a large frying pan and gently fry the parsnip wedges until golden, turning them frequently to avoid burning. Drain on kitchen paper. Pile the mash onto serving plates and scatter with the hazelnuts. Ideal to serve with beef, using the parsnip wedges as a garnish.